I begin this holiday realizing that I’m trying to keep up with the Pittsburgh Orbit and their stupendous, annual flag tribute. They’re already well ahead of me having posted so they can get to the cook outs, hot dogs, and fireworks. Ah, well keeping up with the Pittsburgh Orbit is something I’ll strive for all year. An additional thought occurred to me this Independence Day. Maybe it’s not all thought out but here in America we have freedom. That freedom allows me to be critical of the flag design, which I’ll get into later. Other nations might be less tolerant of such expressions. Of course I’ll see what kind of social media backlash occurs, mind you I am not a trained flag critic so my guess is it will not ruffle many feathers. Few media outlets and social critics pore over my words. While seeking to bring unusual forms of creative expression to the masses, I find it challenging to highlight flag displays. There’s not much creativity in running a flag up a pole. 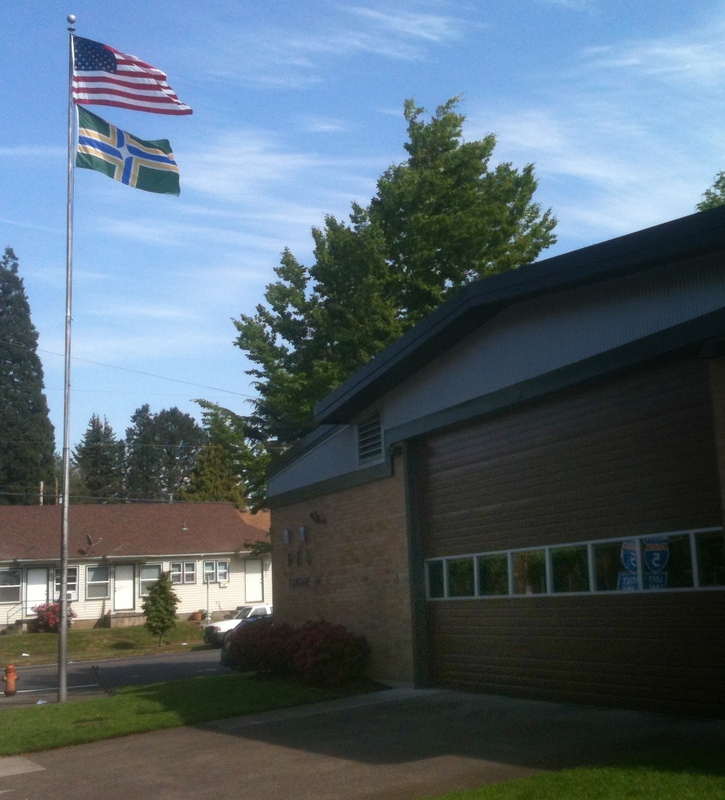 Each year the Special Flag Edition of the Portland Orbit seeks flags displayed in unique ways. 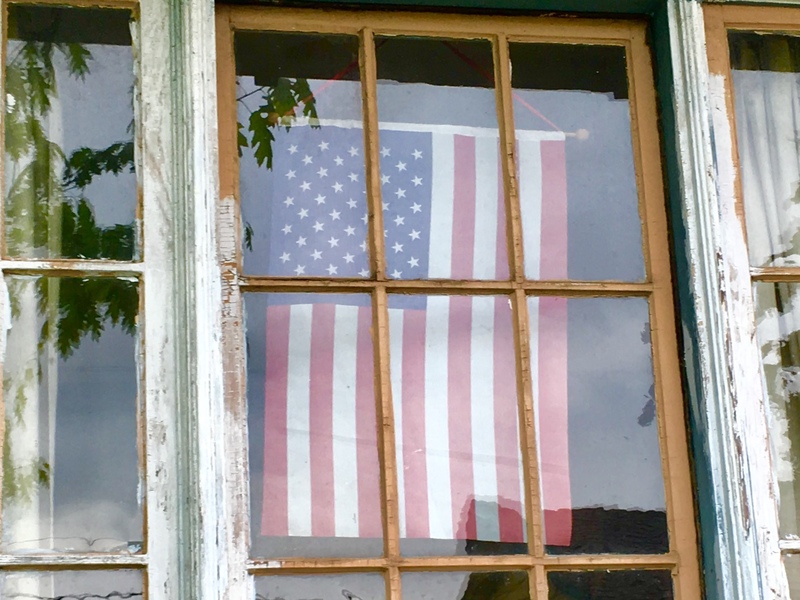 What better way to display a flag than behind glass in a window. It may fade in time but it’s less likely to become frayed from the elements. It’s subtle, alluring even and allows for display any time of day or night. Spotted in the Mt. 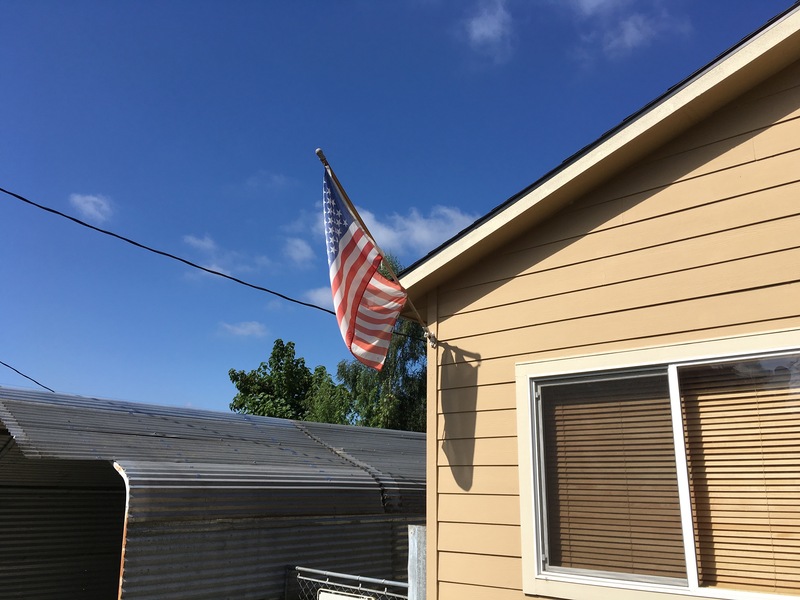 Scott-Arleta neighborhood, this flag decoration may be store-bought but it brings out a sentiment straight out of the Pledge of Allegiance. We are one nation indivisible and all that. 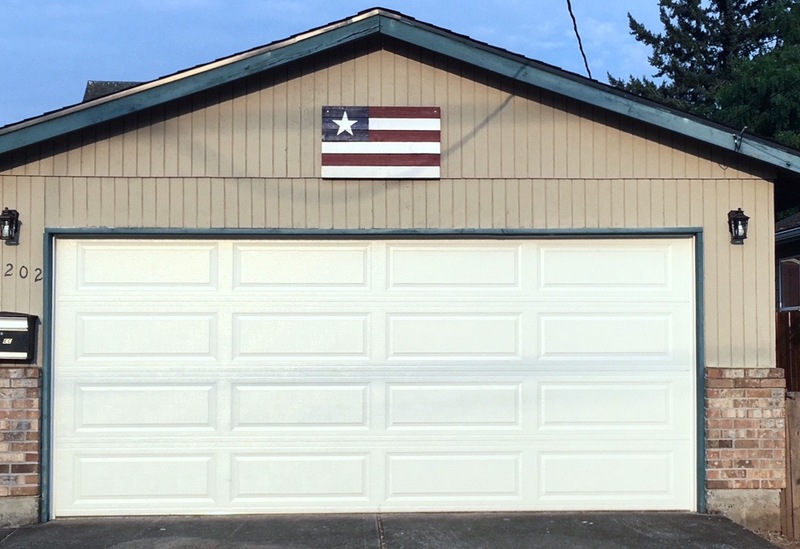 This lone star represents this ideal of singular unity and it does it well. 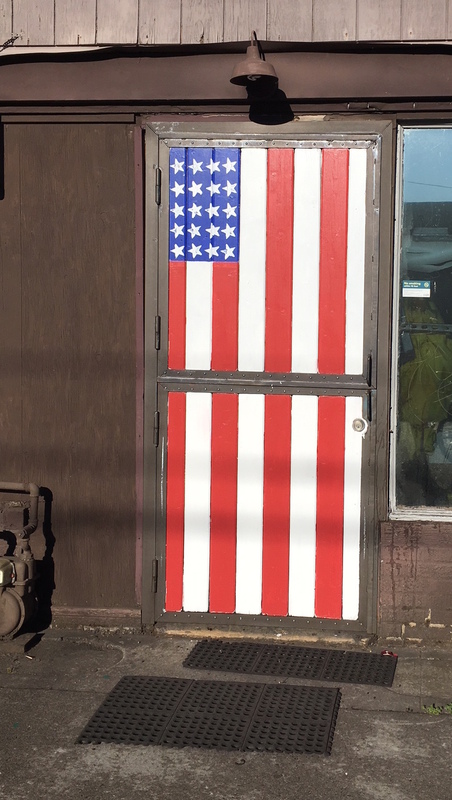 Sure you can make a door out of a flag like this one spotted in the Kerns neighborhood at a business located off of East Burnside Street, but you will lose some stars and stripes along the way. The flag does add bold colors to some drab, brown surroundings. 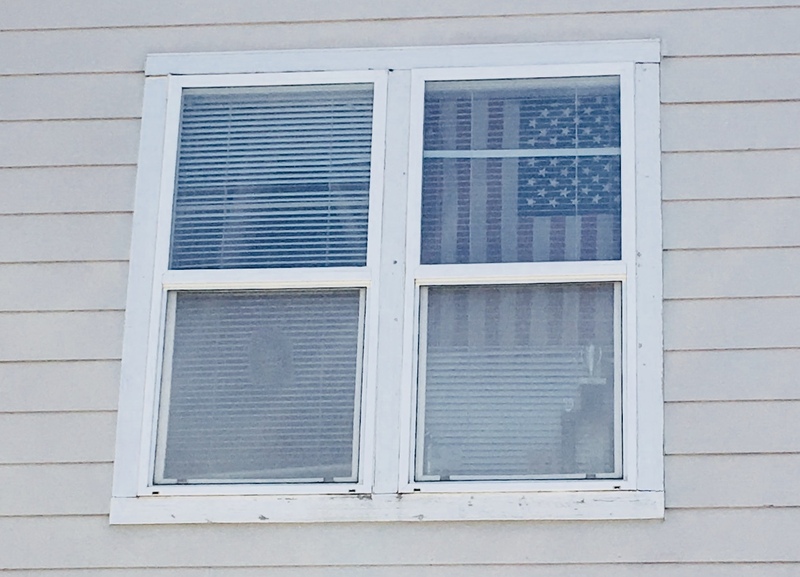 I went searching for yet another flag in a window in the Kenton neighborhood. That proved too challenging to photograph. Then I stumbled on the flag next door. It’s a gem. 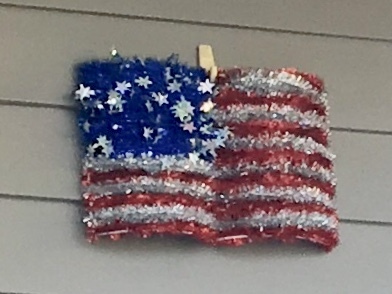 This flag puts the glory in Old Glory with what I want to believe is a homemade design made from fuzzy pipe cleaners. The stars are a jumbled mess shooting into the night sky background, but have you considered the state of our nation lately? It’s almost perfect and celebratory in all it’s flag waving energy. It’s one well done seasonal decoration. Since learning about Vexillology, the study of flag design among other things and a word I still can’t pronounce, it seems like a good time to consider the layout of the American flag. I’ve realized that the rectangle within a rectangle no longer works for me. Why do the stars have to be contained in the upper left hand corner? It cuts off stripes and limits the blue to one section of the flag. I’d prefer the 50 stars spread over the entire flag. Time for an upgrade. While we’re redesigning, we could add a couple of new states. The resistance to new states seems to be that so many flags would become obsolete. My flag design would result in 13 rows of 4 stars. That’s two states added. I’d create an example but my Photoshop skills are lacking. I can’t demonstrate exactly what it would look like but don’t you have to admit it’s a concept worth considering. In the meantime have a happy Fourth Of July. Post Script: A friend posted this on Facebook a while back. I didn’t get far watching it, but I found it interesting to hear Williams riff on coming up with the original design of the flag. Besides I owe him one for comparing his Mrs. Doubtfire look to the look of Evelyn Collins. Capture the flag takes on a whole new meaning when you’re trying to get that shot, the one where a flag unfurls majestically revealing all of its stars and stripes in their full glory. It takes waiting for the right wind or snapping away hoping for that perfect patriotic tear inducing shot. Flags are out aplenty this time of year creating opportunities to make classic all-American images. 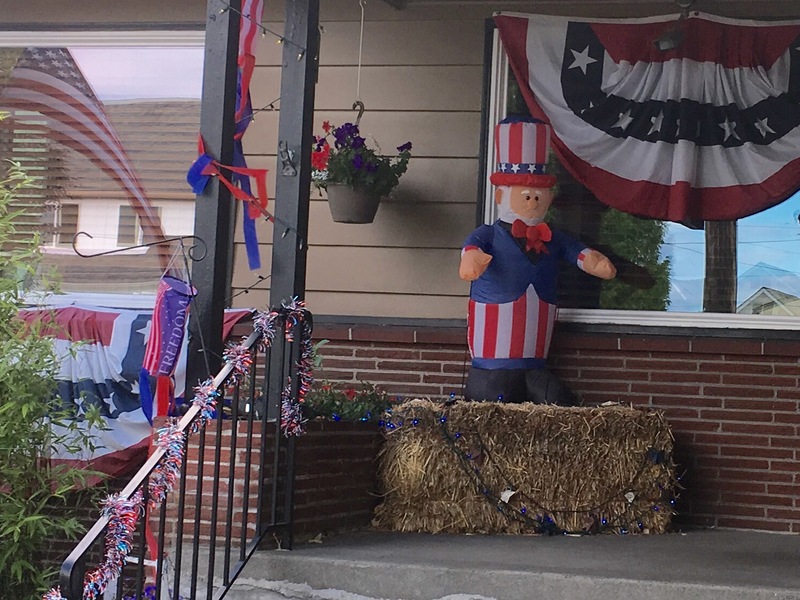 With an inflatable, wind sock and buntings the flag becomes secondary to this Uncle Sam scene but it does manage to sneak its way into the picture. 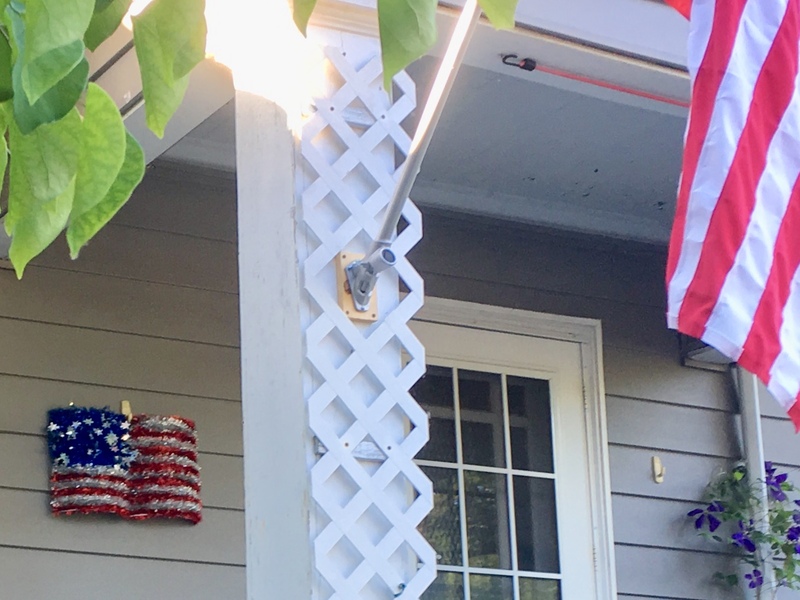 Stars are stripes are essential decorations for this holiday. Sneak them into an old flower pot and they’ll dress that up as well. Not every flag is in the right place to catch air. This flag is unable to display its faded glory. It can only hope to catch the right breeze. Unfurling in a crazy wind. The stripes of old glory here are encountering wind gusts from multiple angles making it tough to unflap its flapibility but it’s not with out effort. A fun sculpture that attempts to heed a warning gets into the spirit of the Fourth of July with the addition of a small flag. 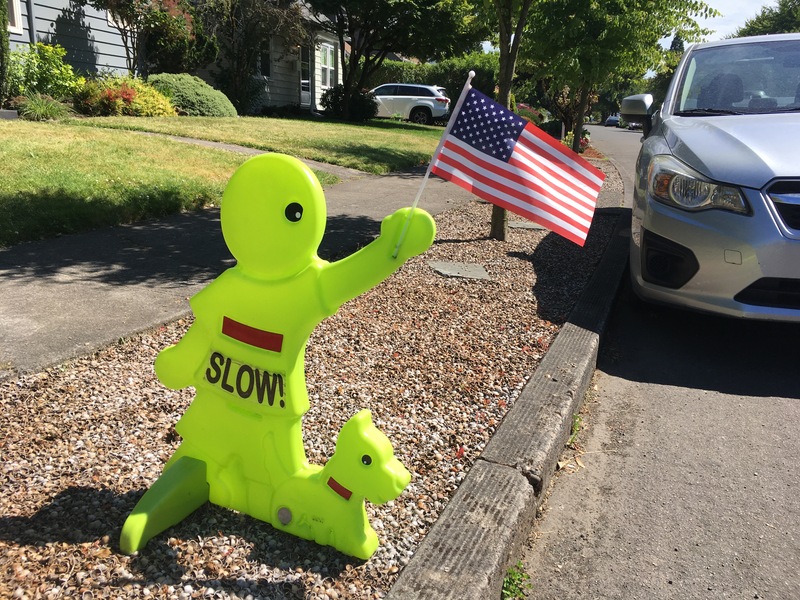 Slow down, heed the patriotism revealed by this plastic boy and dog and you’ll keep kids safe in the process. 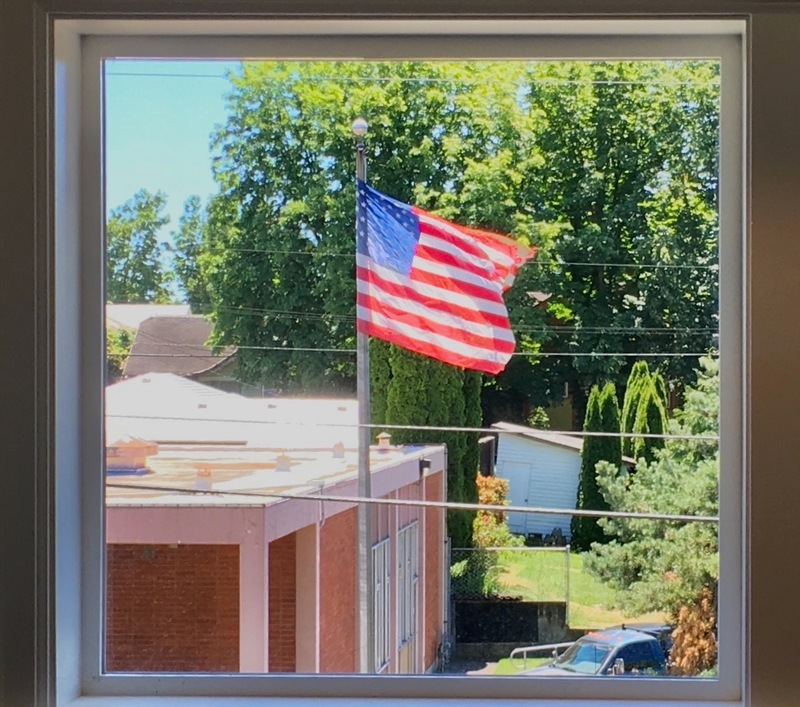 Taken from a new home built across from the Post Office, whoever gets this room is going to wake up to an amazing flag view. On sunny days the sight of this is sure to supercharge anyone’s patriotic fervor. This flag speaks to me about rights and freedom of expression and respect for the goings on behind closed doors. This flag also gets replaced periodically when it becomes tattered. 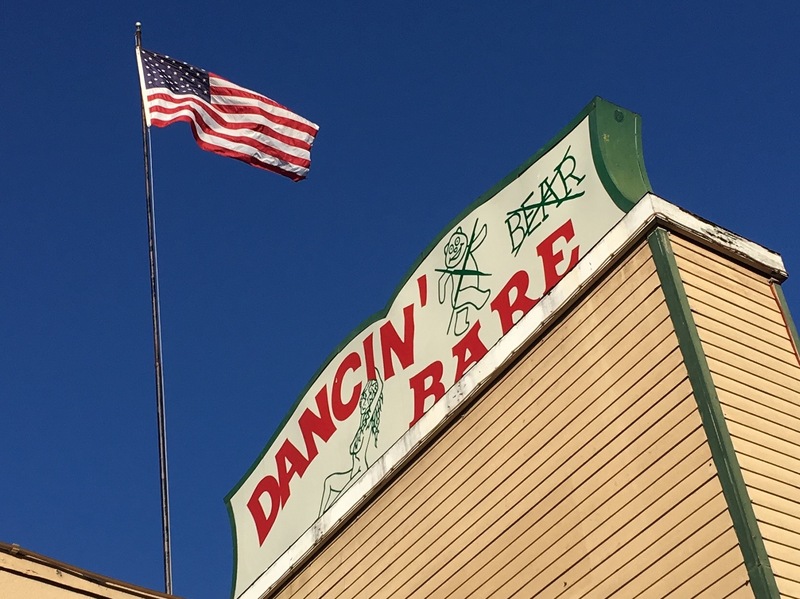 Regardless of what kind of dancing goes on in this establishment, even if bears dance bare, I salute this flag. This one goes out to some time Portland Orbit contributor, Will Simmons, who made a crack about Budweiser drinkers in Portland. 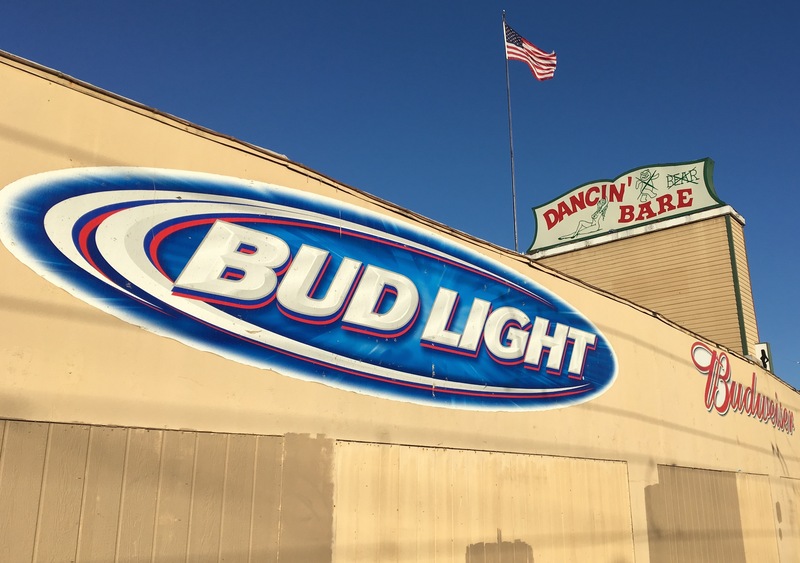 Here’s proof that somebody is at least trying to inspire people to drink Bud and his cousin Bud Light in this town. 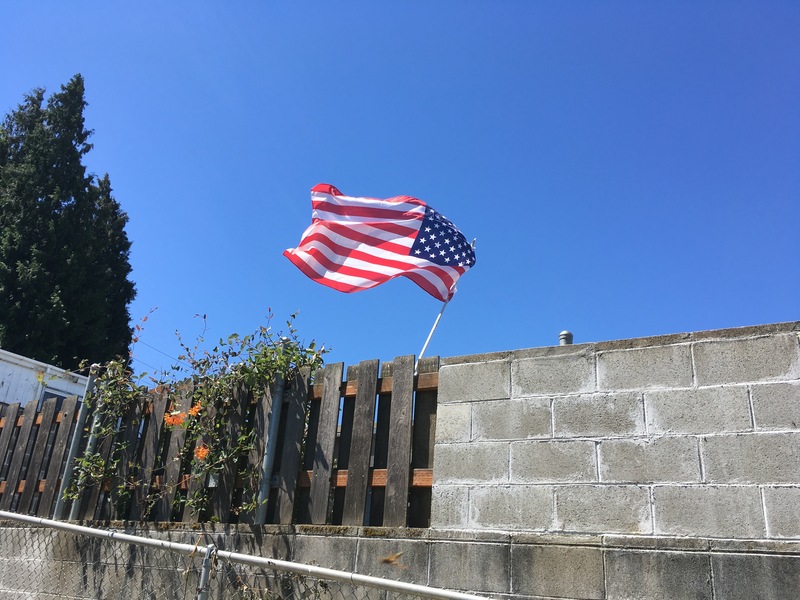 At some point this year it occurred to me that the American flag had been coopted, that it had somehow has come to represent those who use it as a way to show themselves to be more patriotic and even more loyal to American ideals. Sure flag waving has always been a thing but as I aim to keep things light and fluffy around here my flag appreciation remains unfettered. Things in the U.S. are in a state of flux but the flag still represents the hope and a determinations our founding fathers set out for this country in their old school, powdered wig wearing ways. This post, an annual one, is an attempt to extol the joys of flag displays. I want to see the flag as something all Americans understand as well as stand behind. I encourage everyone to get creative with Fourth of July decorations, if only for my entertainment alone. Have a happy July Fourth! 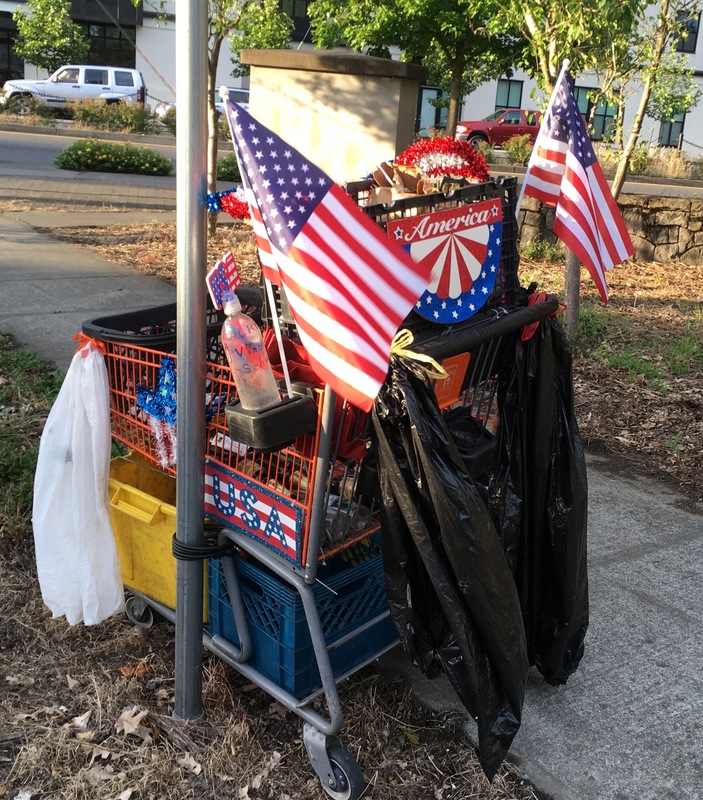 Sure the Fourth of July is all about picnics, fireworks and probably America beer but we can’t forget the decorations found around town. 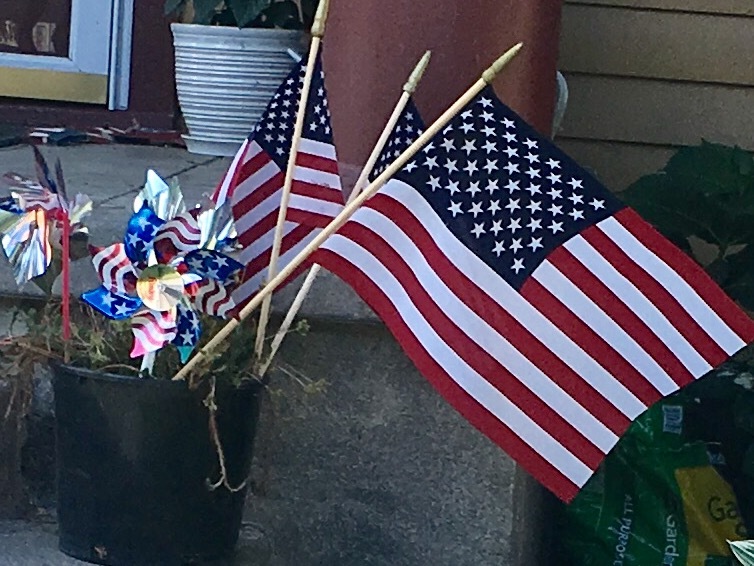 This tradition was started by our cross country rival publication the Pittsburgh Orbit and has inspired a need to showcase displays of patriotism in the Portland area as well. I saw this display around 15th and Broadway in NE. 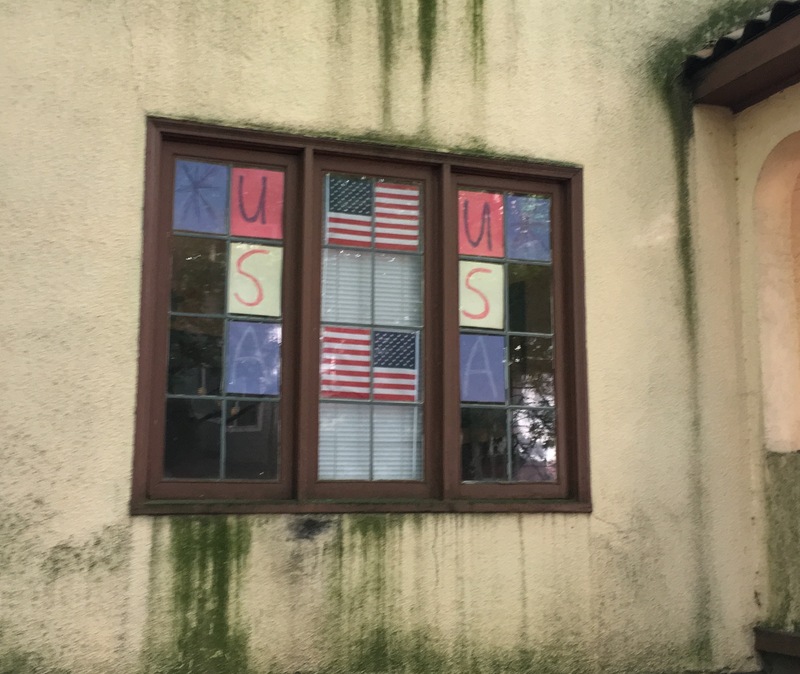 It doesn’t explain itself but it makes good use of it’s window design, construction paper elements and symmetry to create an appealing, eye catching, festival of patriotism. 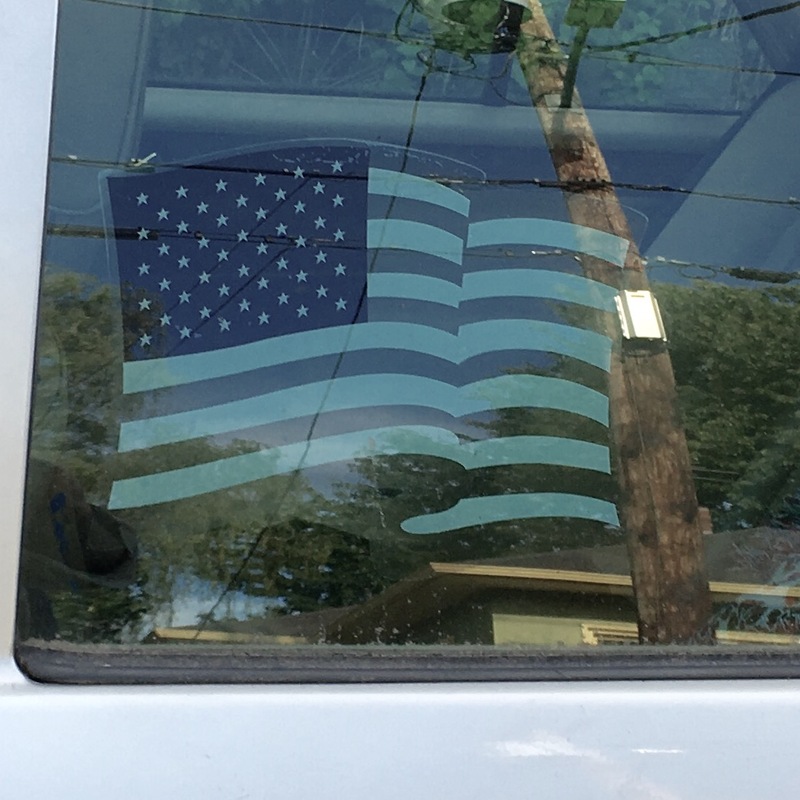 This is a good example of an interior flag decals. Others I’ve seen are faded and peeling off. If this doesn’t make you put your hand over your heart and mumble the Pledge of Allegiance, I don’t know what will. At the tail end of my own shopping cart hysteria, I discovered this mobile can and bottle collecting vehicle chained to a sign at the end of our street. The decor it sports shouts a patriotic fervor that can’t be denied. 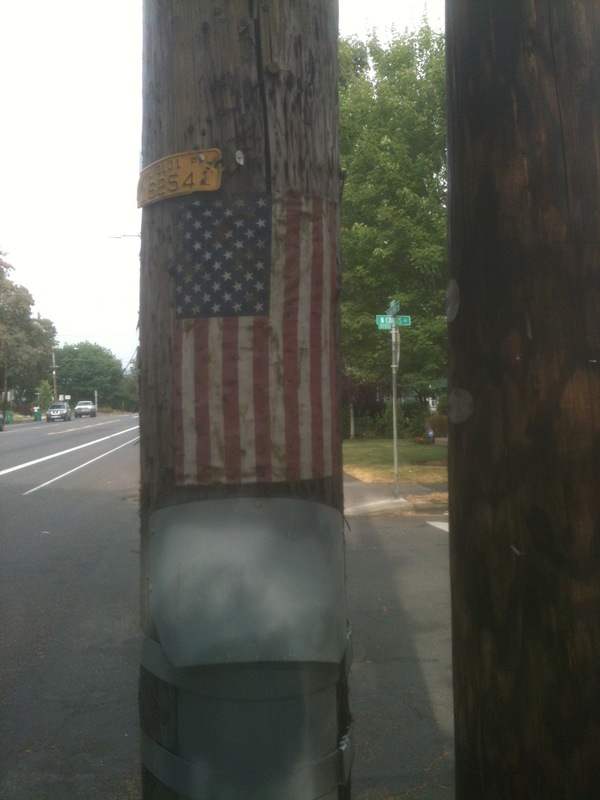 Flag waving sentiments were found within a backdrop of pole art when a cloth flag was affixed to a utility pole in North Portland. This banner may not yet wave like the song says but it does make for a grungy addition of American spirit to an old pole. I like inflatable decorations of any kind, type or holiday so this Uncle Sam bear cub was destined to catch my eye and camera lens. 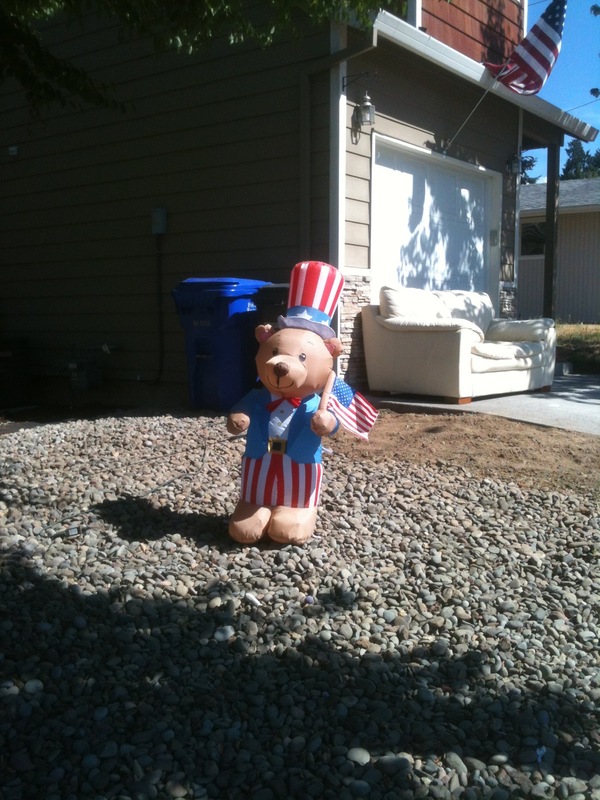 The bear looks great in patriotic plastic. Here’s hoping he can dodge drifting fireworks sparks. Faded glory for sure but this one harkens back to the days when we were all proud to be an America back when Lee Greenwood was haunting many a concert stage. 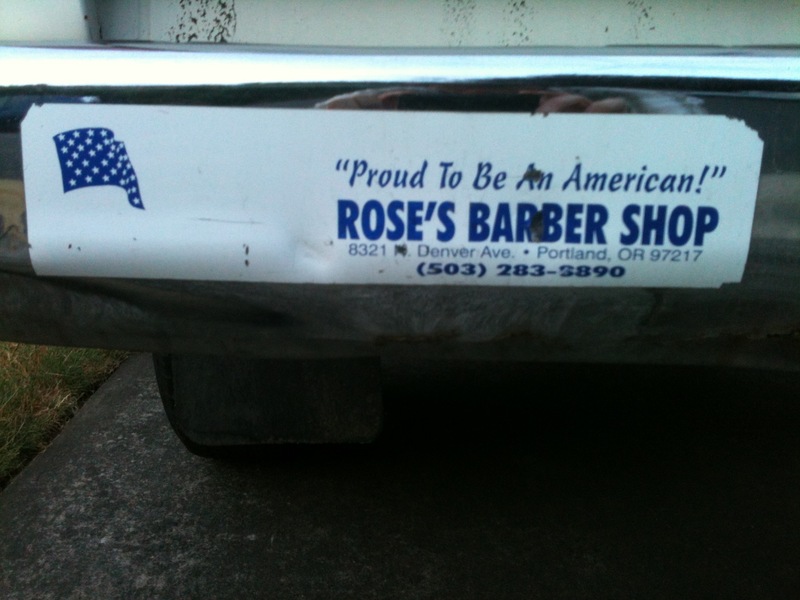 While the stripes have long since faded on the flag, the bumper sticker offers up a historical record of there being yet another barber shop in Kenton. 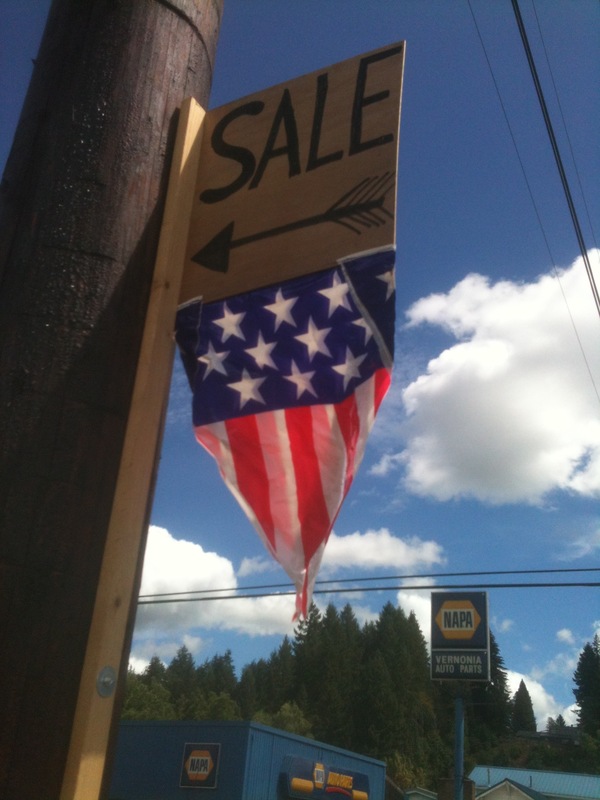 Having made it to the Vernonia Friendship Jamboree on a bike camping trip last summer, I saw this banner decoration attached to a sale sign. Stars and stripes are never a bad way to increase traffic to whatever kind of sale you wish to advertise. On a recent couple of Max train trips I noticed a flag. It had stripes of blue and yellow outlined with white on a green background. I saw it flying over PGE Park. I know, I know it as PGE but it may or may not still be Jeld Wen Field. I had a conversation with someone who said it was now called Providence Park. This could be figured out with a quick search on the web but, anyway, the flag was flying where the Timbers play. I also saw it at a couple of fire stations. I was clued in by a sticker on a car. It was the image of the mystery flag with Portland printed underneath. Some quick internet research confirmed what I did not know after living in Portland for seven years. Portland has a flag. I had been mystified. This flag was all over and looking nordic to me, like a Finnish flag with different colors. A poster I saw while substitute teaching at an elementary school made me realize the colors and design reminded me more of the Tanzania flag. This flag had my imagination wandering. I couldn’t put it together until I saw the decal. To give a true feel for the flag I could have borrowed an image from the internet and used it in this post but I was stuck on that particular decal image. I have no idea why I didn’t take a picture of it when I first saw it. I started obsessing over that decal. I kept going back on dog walks to where I thought I saw the car with the flag decal and I could never find it. It’s not as popular as the decal of the outline of the state of Oregon with the green heart in it. After a few bike commuter rides to a sub job and observing multiple car decals, I ran into the image on Tillamook Ave and snapped a photo. 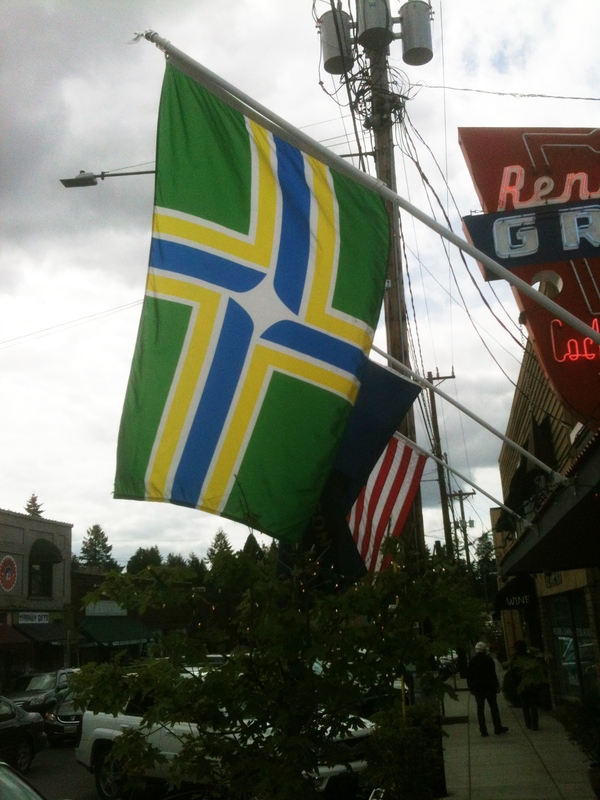 We saw the Portland flag flying outside a restaurant in Multnomah Village and my wife, Ronna, started speculating about what the colors represented, like green being about the ecology and blue symbolizing our rivers. It’s true, the colors and design are all significant. So in order to not get bogged down in those details, allow me to introduce a secondary source. I would have considered good colors for a Portland to be black, red and silver. The same colors as the Trail Blazers or representative of darkness, blood and silver. 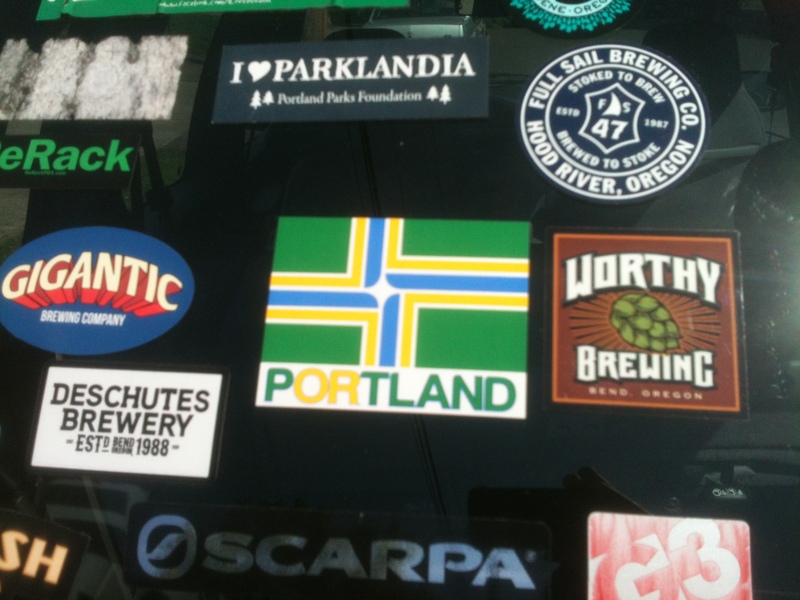 The more amazing thing about my Portland flag discovery was learning about vexillology. I knew nothing about it. I can’t even pronounce it but it makes sense that there would be people interested in flags enough that there would be a science behind it. I could tell you more but you will soon be looking at a blog—what?!? Star Wars flag posts—and possibly be attending a meeting. You’ll become more obsessed with flags and flag decals and their design and symbolism than me.